SOYBEAN PRODUCTION THAT is environmentally correct, socially appropriate, and economically viable is the expectation of the international Round Table on Responsible Soy (RTRS). The initiative began in 2006 with the goal to develop and implement a global certification for the sustainable production, processing, trading, and use of soy. The first version of the RTRS Standard was released in 2010 and by 2011 the first producers were certified in Argentina, Brazil, and Paraguay. Last year, a pilot project on Ontario farms was conducted and the Canadian interpretation of the RTRS standard was finalized. Sixteen farms were certified through South American auditors. This spring, Canadian auditors were trained to provide certification and ensure compliance. It’s anticipated at least 40 farms will participate in the RTRS program during the 2015 growing season. As Canadian RTRS certification expands, farmers can benefit from the experience of those who are already successful with the program and a better understanding of the international demand for certified soy. Multi-faceted Brazilian agricultural company Amaggi has made sustainability a core business strategy. “Sustainability is important because it is a matter of how we can help our business have a very long life. We are preserving what we need in the future,” says Juliana Lopes, Amaggi’s sustainability director. Amaggi Agro operates 14 farms that are RTRS certified and Amaggi Commodity, the trading arm of the company, contracts 320,000 tonnes of RTRS certified soybeans through 51 producers. As a founding member of RTRS, Amaggi played an important role in the discussions around the principles and criteria that need to be followed for certification. “RTRS helps you in the social and environmental management process on your property. There are national interpretations but the discussion about how you define responsible production for soy is international. You know what will be your guide,” says Lopes. Five production principles are at the core of the RTRS standard: legal compliance and good business practices; responsible labour conditions; responsible community relations; environmental responsibility; and good agricultural practices. Lopes believes having certification puts you in a better position with international buyers who are looking to build long-term relationships with responsible sources. All of Amaggi’s RTRS soybeans are exported to Europe where there is high demand for certified soy. However, there are South American divisions of international companies who are also interested in using RTRS soy as a way to meet their sustainability goals. Unilever Brazil has been buying RTRS credits for the past three years. These credits are another aspect of the program which allows companies to show their support for sustainable production. They have also been increasing the amount of physical RTRS soy they use in the manufacturing of their products. Unilever Brazil’s AdeS soy beverage is already produced using 100 per cent RTRS soybeans and last year they started to implement RTRS within their supply stream for soy oil. The soy oil is provided by a crushing facility and Baines is in talks with them to encourage their purchase of soybeans from RTRS farmers. They hope to utilize another 50,000 hectares of RTRS soy in the next two years. 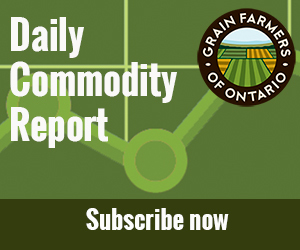 Lopes encourages Canadian exporters to help educate growers about the market for RTRS soybeans, and says it is important to have a supply already in place as more and more companies see the benefits of sourcing sustainable commodities. Baines compares it to the demand companies had 30 years ago for consistent quality. It used to be a challenge to source consistent quality, but that has become a required specification. Now the market demand for certified RTRS soy, forecast to be 10 million tonnes by 2020, is expected to sway production practices. Within the next 10 years, Baines predicts proof of sustainability will be just as common-place. The RTRS association wants to make sure that the established standards remain relevant and is currently undertaking a review which includes consultations with all stakeholders. Version 3.0 of the production standards will be developed as a result of this review. When Canadian farmers were certified under the RTRS system in 2014, auditors had to be brought in from South America. This created a challenging situation for all involved, especially the auditors who did not have experience with Canadian and Ontario laws and regulations nor our farming practices. This spring, 10 auditors from the Canadian Seed Institute (CSI) were trained in the RTRS system. The auditors are based in Ontario and western Canada and already have experience with identity preserved and organic audits. Under the group certification for RTRS, a percentage of farmers will be randomly selected for an audit. This group will then be representative of the remaining farmers under the group certification to allow all farmers under the group certification to become certified. CSI successfully applied for funding from Growing Forward 2 in December 2014 to establish itself as an RTRS certification body. CSI’s training and accreditation of this initial group of auditors will help support their application to become a certification body. Growing Forward 2 will dispense funds accordingly to offset the costs of this roll-out, as CSI is a not-for-profit organization. The end goal will be to establish an Ontario-based RTRS body, which will reduce certification costs for Ontario producers and accredit local inspectors already familiar with Ontario agriculture.